Thank goodness for postponement dates! After rain delayed the WBOP Rugby League Nine-A-Side Tournament by a few days, the weather conditions were perfect on the postponement date and the schools were ready to go. There were some hard fought battles throughout pool play and all the aspects of skill, agility, speed and strength were on display. 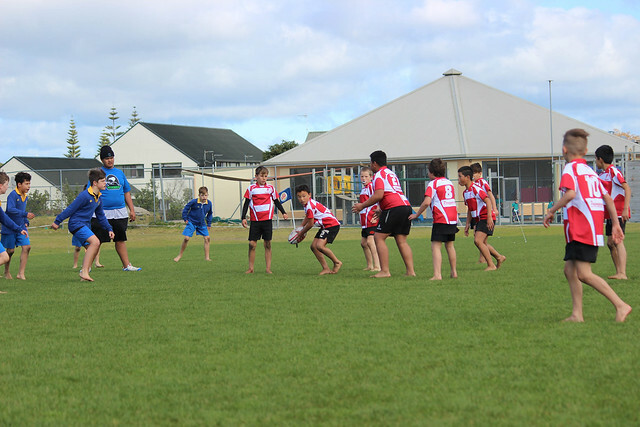 After some very close games in the quarter and semi-final rounds, the final was contested by Otumoetai Primary and TeAkau Ki Papamoa. It was a tough encounter and Otumoetai Primary were this year’s winners. Thanks to Brent and the guys from Rugby League for the awesome set-up at the grounds and to the volunteer referees who did such a great job. Scroll down for a full photo gallery.